Jacqueline is a four-time winner of the Junior Strings Division of COT’s Young Artists’ Competition: she was awarded first place in 2016 and 2019, and second place in 2015 and 2018. In 2017 she won third place in the Tucson Symphony Orchestra’s Young Artist Competition, after which she was featured on KVOA News Channel 4. In 2018, and 2019 she won second place in the Dorothy Vanek Youth Concerto Competition of the Southern Arizona Symphony Orchestra (SASO). In 2018 Jacqueline was invited to perform as a guest soloist with SASO as their youngest soloist ever. Jacqueline was also invited to perform as a guest soloist with the Arizona Symphonic Winds and the Pima Community College Orchestra in 2016. In the summer of 2016, at age 8, she was accepted to the Heifetz Institute Program for the Exceptionally Gifted (PEG) in Virginia as their youngest participant, and then returned in 2017 and 2018. 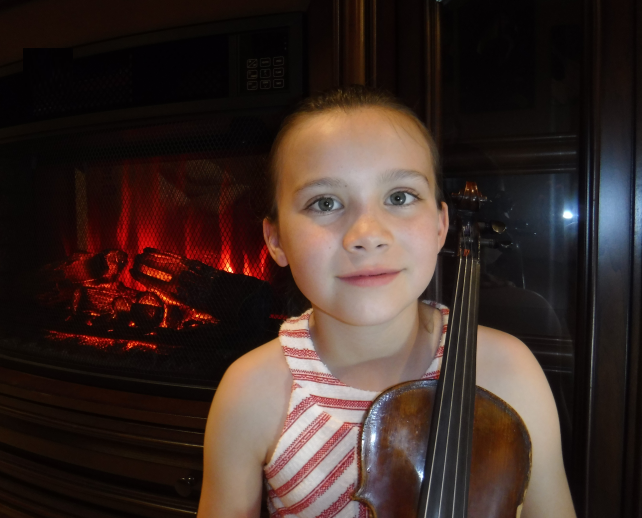 She currently takes violin lessons with Prof. Timothy Kantor at the U of A. Jacqueline also enjoys math, reading and science, as well as playing with her youngest sister, Sophia, and her puppy, Luna. Jacqueline will perform the first movement of Felix Mendelssohn’s Violin Concerto at the May 5 Pops concert at Reid Park.